Cymbeline (also known as Anarchy) is a 2014 American film version of the play Cymbeline by William Shakespeare. The film is directed by Michael Almereyda and stars Ethan Hawke, Ed Harris, Dakota Johnson, Milla Jovovich and John Leguizamo. Based on the play Cymbeline by William Shakespeare, the story revolves around a war between dirty cops and a biker gang. The King of the bikers has lost his sons and needs his daughter to marry royalty to maintain the bloodline. The new Queen wishes to kill the king and her step-daughter in order to install her own son as the new gang leader. The step-daughter has married a penniless gang member, who is banished from the gang territory by the King. The banished son-in-law is tricked into believing that his wife is unfaithful. These many intertwined players will travel through desperate straits before all is resolved. Penn Badgley as Posthumus, penniless amour, then secret husband, of Imogen. Plans to kill her after he is deceived by Iachimo. Peter Gerety as Dr. Cornelius, who undermines the Queen’s plans to kill Cymbeline and Imogen by giving her sleeping pills instead of poison. 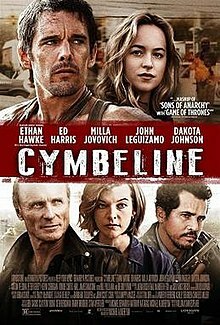 On July 31, 2013, it was announced that Ethan Hawke was re-teaming with director Michael Almereyda to star in the adaptation of Cymbeline. He would play Iachimo and production was set to start on August 19 in New York City. Anthony Katagas and Michael Benaroya would be the producers of the film. On August 5, it was announced that Ed Harris had signed to star opposite Hawke. He would play the role of King Cymbeline. Penn Badgley joined the cast in the adaptation of Cymbeline to play the role of orphan Posthumus who secretly marries the daughter of King Cymbeline and is banished by the monarch who raised Posthumus as a son. On August 8, 2013, Milla Jovovich also joined the cast as a female lead; she would play the role of Queen who schemes to move her own son from a previous marriage onto the throne at the expense of the orphan Posthumus and the King’s daughter. More cast added on 12 August included Anton Yelchin and Dakota Johnson, Yelchin would play Cloten, the son of the Queen by a former husband and Johnson would be playing the role of Imogen, the daughter of King Cymbeline from a previous marriage. Prior to the world premiere of the film, it was announced Lionsgate had acquired all distribution rights to the film. The film had its world premiere at the Venice Film Festival in Italy on September 3, 2014. The film then went to screen at the Busan International Film Festival in South Korea on October 3, 2014. For a short time, the film's U.S. title was Anarchy, but it was changed back to Cymbeline. The film was released in a limited release and through video on demand on March 13, 2015. On review aggregating website Rotten Tomatoes, the film has a score of 31%, based on 29 reviews, with an average rating of 4.6/10. On Metacritic, which uses a weighted score, the film has a rating of 54 out of 100 based on 15 reviews, indicating "mixed or average reviews". ^ "Film Tax Credit – Quarterly Report" (PDF). Empire State Development. March 31, 2016. Retrieved July 23, 2017. ^ Movieclips Trailers (February 25, 2015). "Cymbeline Official Trailer #1 (2015) - Ethan Hawke, Dakota Johnson Movie HD" – via YouTube. ^ a b "Ethan Hawke To Reunite With 'Hamlet' Director For Modern-Day 'Cymbeline'". Deadline Hollywood. July 31, 2013. Retrieved August 7, 2013. ^ "Ethan Hawke to Reteam With Michael Almereyda for 'Cymbeline'". ^ "Ethan Hawke Starring in Shakespeare's 'Cymbeline' Movie". variety.com. July 31, 2013. Retrieved August 7, 2013. ^ "Ed Harris to Star Opposite Ethan Hawke in Film Adaption of Shakespeare 'Cymbeline'". The Hollywood Reporter. August 5, 2013. Retrieved August 8, 2013. ^ "Penn Badgley Added To Shakespeare Adaptation 'Cymbeline'". Deadline Hollywood. August 7, 2013. Retrieved August 8, 2013. ^ "Milla Jovovich Joins Cymbeline". ComingSoon.net. August 8, 2013. Retrieved August 11, 2013. ^ "'Resident Evil's Milla Jovovich Joins Shakespeare Modernization 'Cymbeline'". Deadline Hollywood. August 8, 2013. Retrieved August 11, 2013. ^ "'Cymbeline' casts Anton Yelchin, Dakota Johnson". Digital Spy. August 13, 2013. Retrieved August 13, 2013. ^ "Anton Yelchin and Dakota Johnson Board Cymbeline". ComingSoon.net. August 12, 2013. Retrieved August 13, 2013. ^ McNary, Dave (September 2, 2014). "Ethan Hawke's 'Cymbeline' Gets U.S. Distribution". ^ Debruge, Peter (September 3, 2014). "Venice Film Review: 'Cymbeline'". ^ Jagernauth, Kevin. "Watch: New Trailer For Fiery Shakespeare Tale 'Anarchy' (aka 'Cymbeline') With Ethan Hawke, Milla Jovovich & More - IndieWire". ^ "Dakota Johnson gets Shakespearean in new 'Cymbeline' clip". March 11, 2015. ^ "Cymbeline (2015)". Rotten Tomatoes. Retrieved November 27, 2018. ^ "Cymbeline (2015)". Metacritic. Retrieved November 27, 2018.